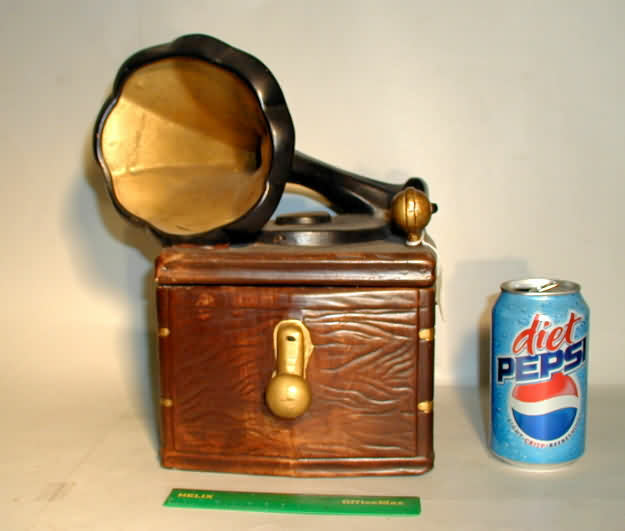 Phonograph Related Novelties, Edison, Light Bulb, etc. 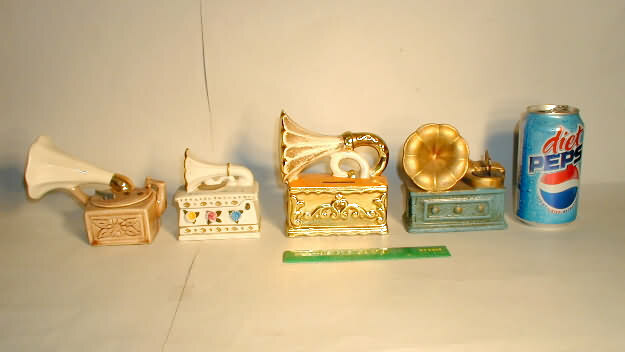 PHONOGRAPH NOVELTIES: Brown porcelain phono; white ceramic phono; gold porcelain phono and a green plaster phono. 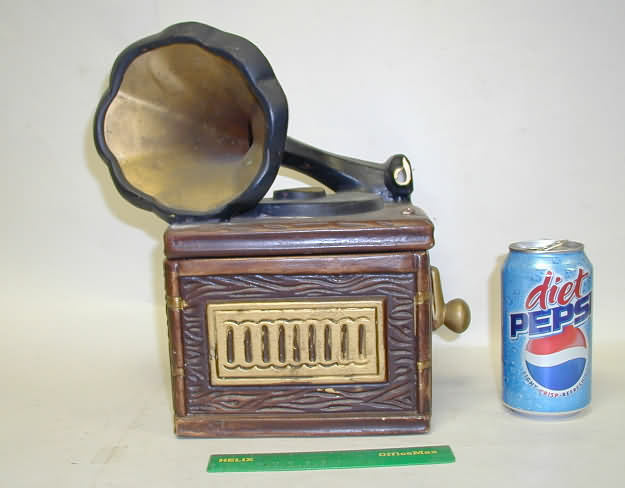 PHONOGRAPH NOVELTIES: Christmas ornament; Amway aftershave phono, brown salt and pepper phonos,; SOLD - the clear plstic music box. 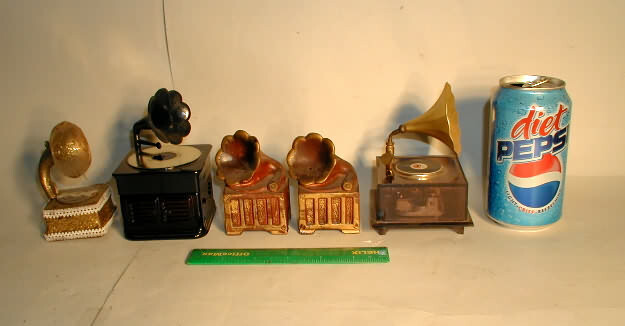 PHONOGRAPH NOVELTIES: white china phono; brown porcelain phono; yellow porcelain phono; black porcelain phono, and a brown/white phono. 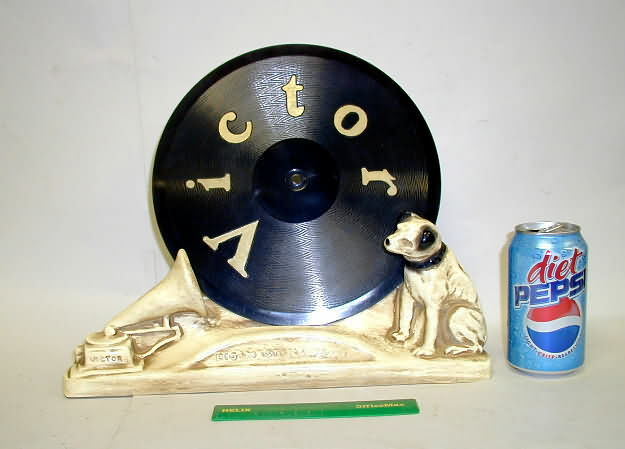 PHONOGRAPH NOVELTIES: Metal music box is sold; 3 refrigerator magnets, and a brown plaster phonograph. 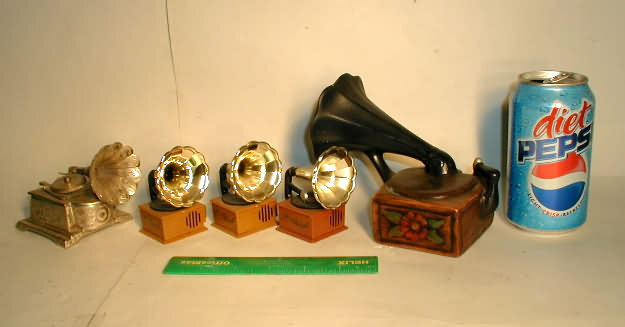 PHONOGRAPH NOVELTIES: Metal gold phono; ceramic phono; pewter phono; bronze metal phono (sold); tiny gold phono (sold) and a wood Christmas ornament. 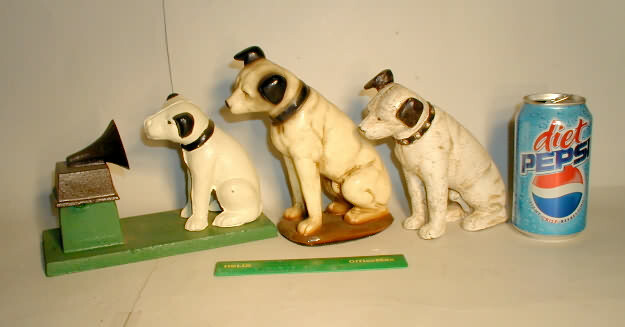 NIPPER ITEMS: Old dealers stock of Nipper listening to a phonograph. Estimate age at 1960's? 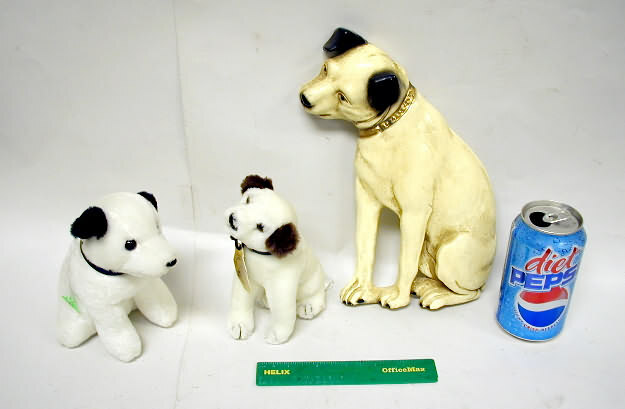 NIPPER ITEMS: A repro cast iron toy (sold); a repro plaster Nipper 7" high, and a white cast iron Nipper (repro) (sold). 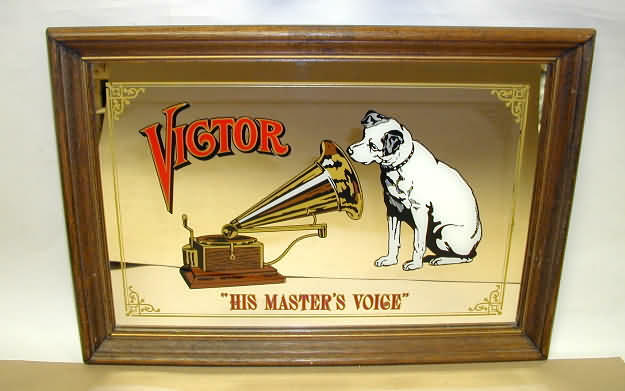 RECORD HOLDER: A reproduction Victor and Nipper record holder (less record), and a Victor one-sided record with the word 'Victor' painted gold. PHONOGRAPH NOVELTIES: Red Christmas ornament; light yellow Salt and Pepper; yellow/white Salt and Pepper, and awhite Christmas ornament. 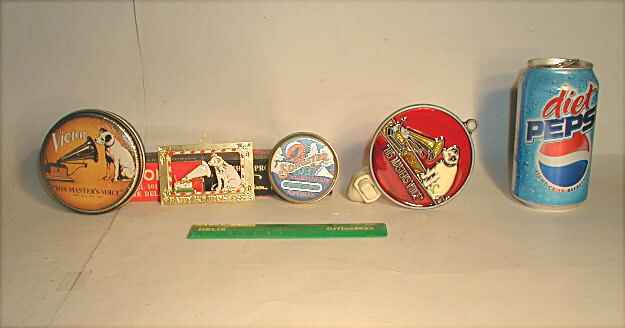 PHONOGRAPH NOVELTIES: Round Victor tin (repro); gold metal 1988 Christmas ornament (sold); Songster needle tin (repro) and a Nipper nite light. 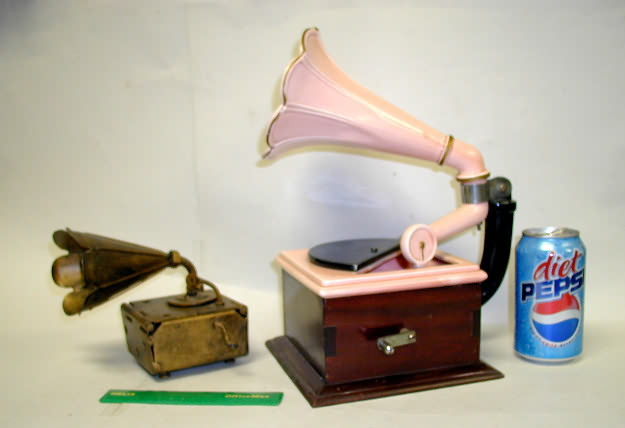 PHONOGRAPH NOVELTIES: A metal tramp art phonograph and a pink plastic plant holder(?) with nice wood base. COOKIE JAR: A plaster cookie jar with removeable lid, 7 1/8 wide x 11 3/4 inches high. COOKIE JAR: Same as #2512 above except this one has the phonograph arm broken off. Perhaps you have this same one with a broken bottom that you can use this good bottom with? 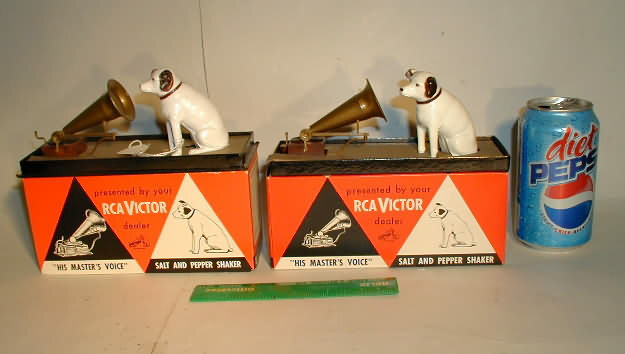 PHONOGRAPH NOVELTIES: White china music box; orange planter and a black/white music box. 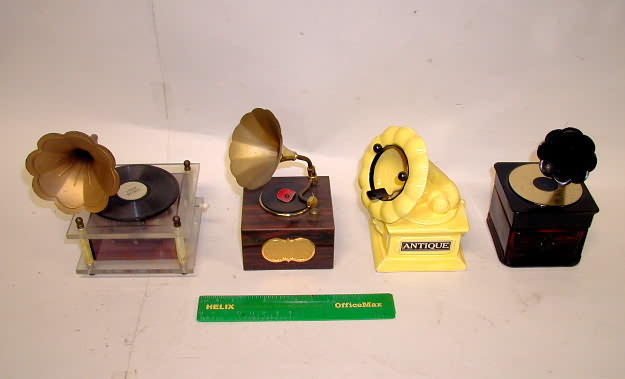 PHONOGRAPH NOVELTIES: Plastic music box (sold); another plastic music box (sold); yellow ceramic phono (ashtray?, black ring removeable) and a Amway after shave bottle. 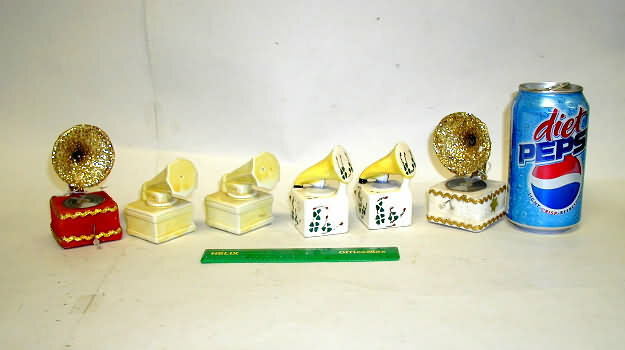 PHONOGRAPH NOVELTIES: green Christmas ornament; boxed Salt and Pepper; ceramic Nipper with box (sold), and another Salt and Pepper (no box). 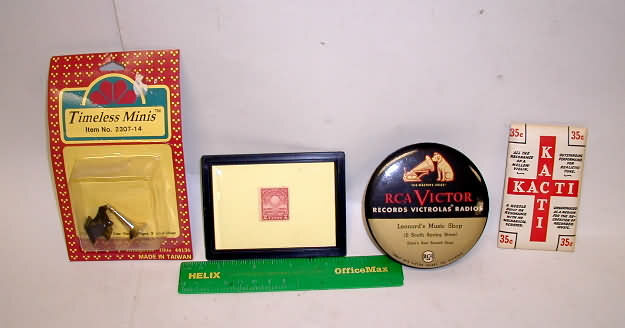 PHONOGRAPH NOVELTIES: Miniature doll house phono; 1929 Edison stamp with light bulb; Victor record duster (sold) and a package of wood needles (about 10 pieces). 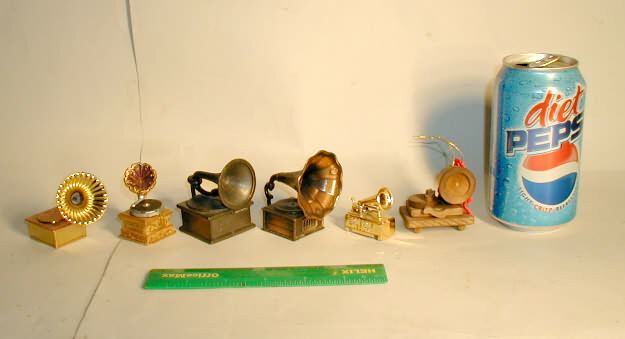 PHONOGRAPH NOVELTIES: Metal pencil shrpner; plastic horn (repaired); another plastic horn; metal coffee grinder, and a tiny wood cylinder phonograph. PHONOGRAPH MIIROR/SIGN: Nice mirror/sign to hang on wall, estimate age at 1970's(? ), size is 20 1/2 wide and 14 1/2 inches high. 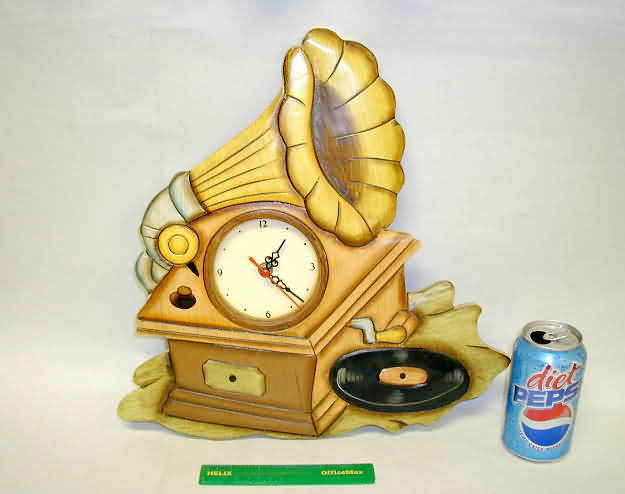 WALL CLOCK: Nice decorator item, this is a phongraph clock, made of wood. Size is 14 3/4 wide and 15 inches high. Uses one AA battery. 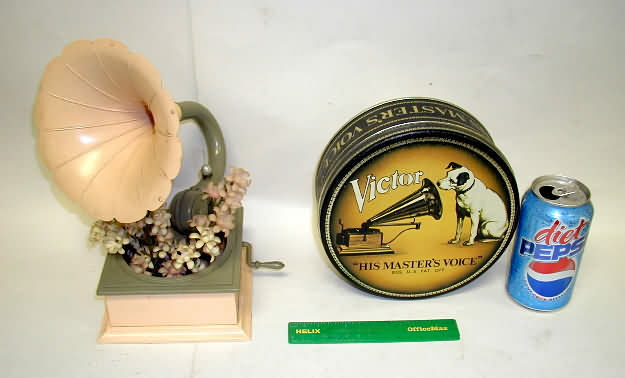 PHONOGRAPH NOVLTIES: A pink and gray phonograph planter - 10 1/2 inches high, right is a repro Nipper Tin - sold.